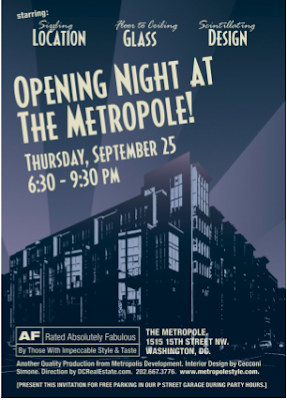 I received an emailed invitation this afternoon to the Metropole's grand opening on September 25. I'd love to attend, if only to see whether my unit (#222) is still available. Come on Powerball! Make me a winner! Contestants must name the date by which a unit will be listed on MLS. Craiglist ads are acceptable substitutes. Listings from the Metropole's marketing company are excluded from this contest. The listing must be a true resale, i.e., the owner closed on the unit and has placed it back on the market to make an obscene profit or avoid losing his/her shirt/skirt. The District's real property sales database will be used for verification of the original sale. The winner will be the person whose proposed date is closest to the actual date of the first listing. The winner will be named once a confirmed MLS listing is emailed to yours truly. The email should contain the MLS # and, even better, a URL for the listing. In case of a tie, I'll break it. And I suppose a prize is expected... OK, the winner gets a martini at Halo, my treat. Which means you have to be over 21. I'm pretty sure that part of the Metropole purchase agreement was a requirement that the owner occupy - or at least maintain ownership of without renting - the property for a minimum of one year after closing. I've seen this other places to minimize "flipping." The newly-formed condo association can probably vote to change the rule, but I actually think it's a good one provided there are exemptions for life events like sudden long-term disability, job loss, or birth of a child during the first year (or perhaps while waiting for construction). As for a "flipper," would someone want to casually open herself to legal action by breaking a contract? I'm not sure.